I was browsing through my local used building material store when I came across this, um, contraption. At first I thought, water-saving toilet? Something for a boat? When I walked around to the back I saw that the sink drained directly in to the toilet bowl with no toilet tank so there wouldn't be much water savings. When I got back to my computer I looked up "toilet-sink" and found an image that looked just like it. I guess I haven't been watching those cop shows carefully enough because what I stumbled on was a prison cell toilet. Now that would be an interesting conversation starter. In fact, I could add it to my front yard décor for my mobile home. I'm thinking toilet-sink fountain right next to the bathtub planter. All it would need was an outdoor shower to complete the theme. HA!!!!! Tag this another "Plumbing Fail"! I think this fits right in with the stainless steel craze, don't you? 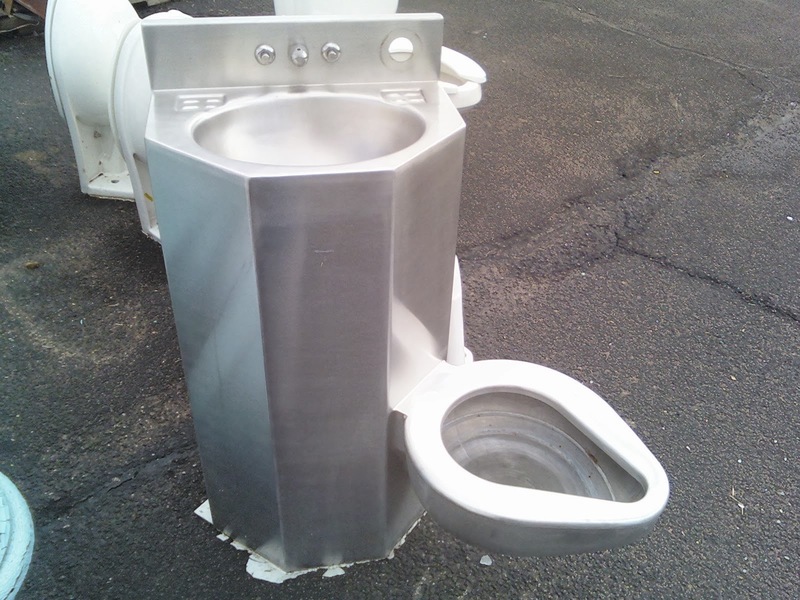 Stainless steel kitchens and matching stainless steel toilet-sinks. I was hoping you'd not also tag this as "Kitchen Inspiration" but you do make an excellent point.